President Obama walks toward the Oval Office after arriving home early from a campaign swing to Florida. The president shortened his morning event, and canceled his afternoon event due to the tragic shootings in Colorado. 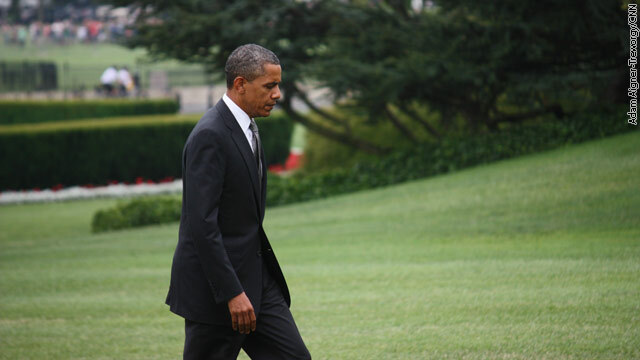 Obama receives additional briefing on Colo. Immediately after arriving back at the White House on Friday afternoon, President Obama met with senior advisers in the Oval Office for a briefing on the ongoing investigation into the mass shooting in Aurora, Colorado Friday morning. The president walked from Marine 1 on the South Lawn directly into the Oval Office for a meeting with FBI Director Robert Mueller, Chief of Staff Jack Lew, chief counter-terrorism adviser John Brennan, senior adviser Valerie Jarret and White House Counsel Kathy Ruemmler. You may not, but most people do care. Watch this to see how desperate Romney has become. we don't want him out here ... there's no room for politics. tell him to send his condolences by not showing up to take away from our time of grief. stay in washington bo. "Yeah ... like I told the Russians ... I'll be more flexible after the election ... code words for: if I get reelected, I'll be able to go back on all my campaign promises ... just like I did in 2008. And, what if I do cover up my crimes ... what are you going to do about it .. complain to the mainstream media? ... they will just defend and excuse me ... they always do. And what if there is incriminating evidence against me? Well, I'll just bury the records, and invoke executive privilege ... and if that doesn't work, who are you going to go to for justice ... Eric Holder? ... Holder works for me !!!" MOST BAD PEOPLE? IT IS NOT YOUR AVERAGE ROBBER. THIS MONSTER PLANNED EVERYTHING, HE DID NOT HESITATE TO SHOOT AND HE HAD FOUR GUNS. ANOTHER PERSON WITH A FIREARM WILL JUST ADD TO THE CHAOS AND GRANDPA WITH A POPGUN WOULD MOST LIKELY HAVE DIED JUST FROM SMOKE INHALATION. LET'S NOT POLITICIZE THIS FURTHER WITH GUN RIGHTS VS GUN CONTROL ALTHOUGH I HAVE TO WONDER HOW HE GOT A HOLD OF SO MANY GUNS AND EXPLOSIVES. ONLY A COWARD WOULD BRING A LOADED GUN IN A MOVIE THEATER. THAT'S WHAT THIS GUY IS, A COWARD. I GUESS IT"S OK FOR THE LIKES OF YOU TO PROTECT HIS RIGHTS TO DO WHAT HE DID. I"M NOT SURPRISED ONE BIT. even in the face of tragedy the republican idiots continue to make rude hateful crass remarks. Does that tell you antthing about the mentality of these goons. Why would you vote for such a hateful group of clowns. Vote all repos out. Take this country back from these war mongers.prayers to the colorado familys. Thank you Mr. President for being a voice of reason. Class is something the republicans don't seem to understand. And this was full of love, right? Just like trying to pin the AZ tragedy on the before the scene was even cleared. You prove to be just as culpable. Your idol Sarah Palin had targets over the heads of the opponents of her 'choosen people. Gee, some people think that's creepy. I can't picture you crying over anything BUT your wallet. Cynthia–you have a short memory and a long nose. You have a concern about where your money goes. Well, the police responded in 1 1/2 minutes. You said in a past post that if people needed help they can KNOCK ON YOUR DOOR. Well, gee, it was past midnight and I'm sure you would have put the pillow over your head or, fell to your shaking knees and called 911. Romney say anything crass or hateful? Did I say anything crass or hurtful? Chiding others and then doing the exact same thing you are chiding others for. In saying all of that too bad we can be sensitive for this one story! actually the only people who have kindly sent their condolences are the republicans. we've heard nothing but lipservice from the other side. stay at home obama. leave us to our families and friends here in aurora – we don't need washington out here. if we did – we would invite you. Guess what, Carl, the President represents the rest of us and we have been focused on Colorado through the fires and through this horrible situation in Aurora, which I myself have friends and relatives and am a past resident of the state for 25 years APPRECIATE. The Federal Government has helped with both disasters. So we all have invested in your part of the country. You, Carl, have nothing to offer any of us but your profound stupidy, selfishness and CRASSNESS. And from your past posts on other subjects you are likely the most hateful, and ignorant jerk on here. Gee, Jerry, your hero RUSH LIMBAUGH was spouting off about how the movie 'Dark Knight' had an evil character named Bane that the Democrats were covertly telling the audience was BAIN of Romney fame – TWO DAYS AGO. Now, with that said; I think HOLLYWOOD has added to the gun-loving, shoot-'em-up problems THE WORLD is experiencing, all to the gun makers delight. SHAME ON YOU!!!! You have created a moral disaster for the sake of 'entertainment'. No one is safe from the mentally ill if they fall through the cracks and the people who notice that they are don't say a thing. And all you have to do is create an 'ILLUSION' of a threat to set them off on a killing spree. RUSH and HOLLYWOOD= the NRA. So here you go, just like in the AZ tragedy, blaming Limbaugh before the first tears even hit the ground! I seriously doubt a 24 year old from San Diego attempting to earn his Doctorate in neuroscience (though it sounds like he was dropping out) sat around and took instructions from any talkshow host. Funny you try to indict hollywierd here, when it is the breadbasket of liberal elitism sucking money out of american's wallets for the exact entertainment you decry. Now, that being said, I commend O for cutting short his FL trip to determine if this was a bigger issue. Please spare me your concern about squat. Absolutely not...I have told you before I am no Rush or Romney appologist, but the disgustingness of you and your ilk pointing fingers this quickly when the current facts heavily suggest otherwise. But, like all good liberals, "You never want a serious crisis to go to waste ..."
I was disgusted three nights ago you twit. Rush was absolutely nutcakes and SOME NUTCASE was listening. Me and MY ILK? You are an apoligist for being a couch potato – nothing more–nothing less. So much for civil dialogue and compassion from the lefties here. From what I've read this kid was normal most of his life with no law problems. We'll find out eventually what made him snap but one things for sure, he should be executed. The whole thing is pitiful and no one in a good and balanced mind would have done such a thing. We have to care and stop looking away from the things we should look at. My condolences with great sadness are tinged with frustration. I am not a lefty OR a righty. I am a person. So stop the attempt at separating me from mine which are my countrymen. May God help and give comfort to the family and friends of those lost. ANYONE WHO IS TURNING THIS INTO SOMETHING POLITICAL SHOULD BE ASHAMED AND WE SHOULD ALL FOLLOW THE LEAD OF BOTH OBAMA AND ROMNEY ON THIS. ASIDE FROM JERRY'S SPECIAL NEEDS COMMENT, THERE SHOULD BE NOTHING HERE TO FURTHER STAIN THIS DAY. AS FOR JUSTICE, WE ALL HAVE OUR PERSONAL FEELINGS BUT WE SHOULD SEE THROUGH THIS WITH RESPECT FOR THE LAW. PERSONALLY, I WANT THAT "THING" BE TREATED LIKE A TERRORIST IN A JORDANIAN PRISON. I agree with you again! Colorado shooter, James Holmes had previously worked at a CIA lab in Colorado Springs at The Air Force Academy. Friends & family believe he was "brainwashed" while involved in experiments at the lab involving mind control. It seems a weird coincidence this tragedy happened just one week prior to Hillary Clinton signing the UN Small Weapons Treaty. If citizens of Denver carried,this nut job could have been taken down right away. Instead people could not defend themselves,and could only hide and watch this guy kill 12 people. No doubt gun control freaks,far lefties,and controll freaks will try to turn this into a campaigh to tighten or ban guns and a citizens right to protect themselves from such people. The more I read about this kid the more it seems like it was something fairly recent that unhinged him. He was a good student up to the time he dropped out of the program, I guess he had trouble finding work but would that be enough to make him do what he did? The authorities said at first he was talkative but once he got a lawyer he refused to help out any more. It's strange he gave up, usually this type would want to go out in a blaze of glory, he obviously wanted to kill some police and neighbors too. They said his apartment had enough flammables and explosives in it to easily take out several apartments. He obviously gave this a lot of thought. he is a social path, a nut case....planned this for months. The end....has nothing to do with anything else. I happens, get over it. Maybe you libs will try and find a way to throw money at it...money that is not yours. Idiots! It should be political. What do we expect from a society that relishes on-screen violence? Its not that these things have never happened before but that they are happening with much more frequency. Is Hollywoods art(thirst for money) worth this? On-screen violence was this kid source of ideas. Practically every TV show is full of violence, all the CSI's and even the "reality" shows, movies are even worse. Hollywood does indeed promote senseless killing in graphic detail. I doubt that anything will change, sad to say. The power to change it rests with those of us who pay money to view these movies. We don't go, these movies don't make money, studios shy away from movies that make no money. The other side of this argument is, with very few exceptions, folks have a right to see what they want. I'm on your side on this one, Frank. What we see as entertainment on TV and in the MOVIES, in PRINT, in VIDEO GAMES AND what is out there ON-THE-RADIO is some very strange, dangerous, and mind-boggling crap. I think we can do something about it by saying what you just said. I personally do not watch horrific horror, violence, and gun toting anything. If it is history, I try to watch to learn something but, that even gets too much because it is offered up TOO MUCH. There are so many uplifting, positive, creative, challenging ways to make movies that make you laugh, think, feel, at not only human nature but that found in nature. I never gave my children toy guns to play with. I did not allow them to watch overly violent films. They were taught gun safety, and learn to hunt,and if we saw them disrespect animals or humans as just targets they were corrected on how important it is to take life as precious. They are in the military and I hope they will always take those lessons with them. You have to live with the decisions you make for the rest of your life, so come from a place that is solid and grounded and when and if you are faced with taking a life or, protecting your own or, anothers, it is done in the most serious and solemn way. I challenge HOLLYWOOD and those on TV and those on TALK RADIO to give us something more uplifting, which can be found every single day, because we live in such a dangerous world and always have. But, knowing they have a responsiblity to what they put out and NOT add to the problems the world faces with disregard for the consequences, like the shooting in Colorado that will have a ripple effect for years to come. I give you a hard time. You give it back. Somehow, I think it all can be done better. WHERE ARE THE JOBS OBAMA? 14% unemployment. 16 trillion in debt. WHERE ARE THE JOBS OBAMA? yes the leftist are making heroes out of police and fire here...the very unions who are destroying communities economically....another mess. Since 911 these unions have robbed us blind. As our country slips into poverty (highest now since 1965, LBJs war on poverty) there will be more violence as the food stampers and SSI moochers run out of support.